RPM A-arms F/R for the Traxxas Slash 4x4 & Stampede 4x4, Blue Discounts Apply ! 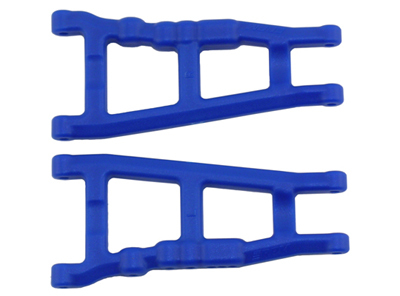 RPM80705 - RPM A-arms F/R for the Traxxas Slash 4x4 & Stampede 4x4, Blue. Tech Notes: RPM A-arms for the Traxxas Slash 4x4 & Stampede 4x4 are sold in sets of 1 left and 1 right A-arm in each package. Two packages will be needed to complete one truck. The upper hinge pin hole of the rear axle carriers cannot be used (not a stock location for the Slash 4x4 or Stampede 4x4) due to strengthening designs that reduce the clearance around the rear axle.